By Rocco Arpa, Senior R&D Engineer at OPTIMAD. OPTIMAD selected Open Inventor as the core 3D visualization component for the CAMILO 3D-surface design tool for aerodynamic optimization. OPTIMAD (Optimization Methods for Aerodynamic Design) develops advanced analysis, design, and optimization software for solving complex fluid-dynamical phenomena in nearly every industry: automotive and aeronautical engineering, urban flows, turbomachinery, and more. 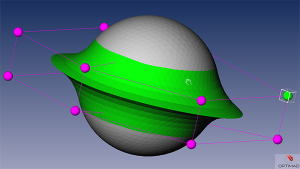 CAMILO’s engine is based on Free Form Deformation (FFD) algorithms and employs level-set techniques to ensure constraints control between deformable and undeformable parts of the geometry, as in the case of local deformations. 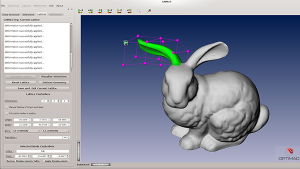 How does Open Inventor help you develop CAMILO software? "The Open Inventor SDK helps us to quickly develop a handy graphical user interface, dealing with large superficial meshes, representing the 3D shape, and highly simplifying the management of user interaction with the 3D object in the scene." explains Rocco Arpa. 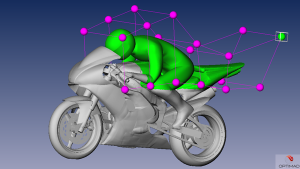 "Selecting deformable parts of the object’s superficial mesh, moving FFD control nodes to deform the object, visualize data attached to the mesh and efficiently storing it in a suitable data structure are all handled with the Core Open Inventor and MeshViz XLM features. As a developer’s experience, the C++ API is highly flexible and very easy to integrate with your own algorithms and features, providing a high level and solid foundation for GUI programming." OPTIMAD (Optimization Methods for Aerodynamic Design) develops software for aerodynamic analysis, design and optimization. The company was founded in 2006 by fluid mechanics researchers as a spin-off of the Department of Mechanical and Aerospace Engineering of the Politecnico di Torino. The areas of expertise range from modelling and numerical simulations of multi-disciplinary systems (for both internal and external aerodynamics), to shape optimization and preliminary design, and wind power feasibility and forecasting. Open Inventor® is the leading platform for developers of all types of engineering software, for Cloud, desktop and mobile environments. Open Inventor's easy-to-use API, extensible architecture, and large set of advanced components provide developers with a high-level platform for rapid prototyping and development of 3D graphics software applications for CAD & CAE.